Is it too early for a Holiday themed blog post? I hope not because two very sweet darlings want me to ask you what do you think they should expect to find in their Christmas stockings this year. This is the naughty little Holiday bear. See that troubled expression on his face? That’s because he’s been naughty throughout the year, giving his mama a hard time. Now that Christmas is approaching, he’s worried he’s going to end up with a lump of coal in his stocking. This cheerful fella, on the other hand, has been really nice this year and he is excited to see what Santa will bring for him. Personally he’d prefer a 3D printer but he knows Santa’s elves don’t do 3D printer because promoting that kind of technology would practically leave them jobless. While these two Naughty and Nice Holiday Bears chalk up their wish list, I’ll let you into a secret—I cheated while making these amigurumis! Now that I have your undivided attention, let me explain. Both these amigurumi bears have been designed in such a way that they can be out on display throughout the year, and not just on Christmas. Since they do not come in traditional Christmas colors as you must have noticed, all you need to do is remove their hats and scarves and hide away their stockings and they are good for any season 😀 And now, it’s time for some free goodies! 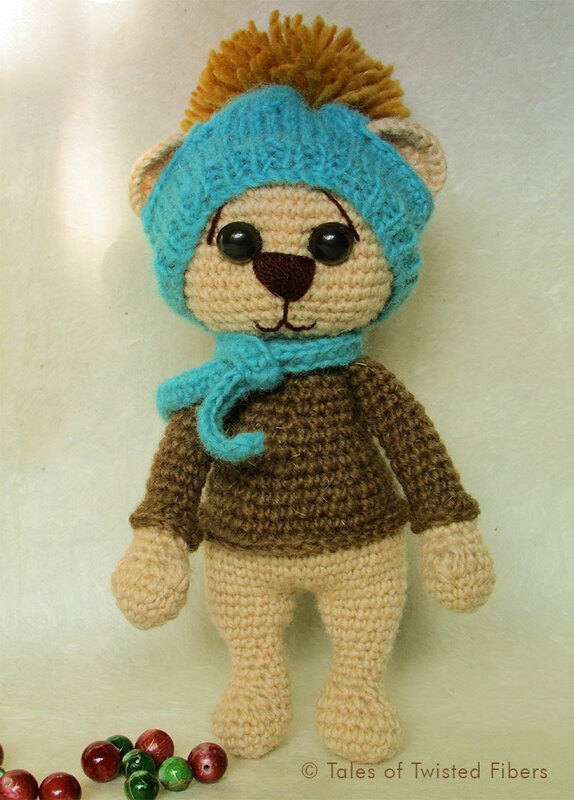 Who wants free patterns for these amigurumi Holiday Bears? 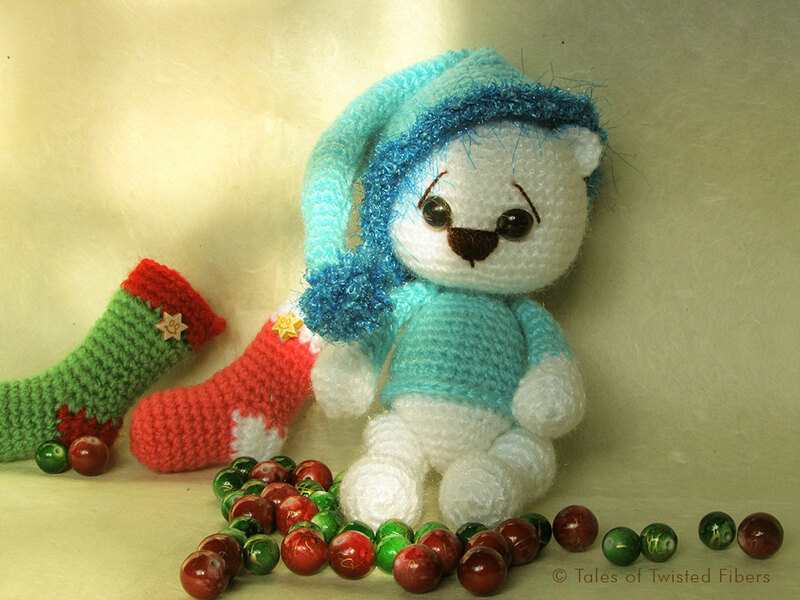 Each of these two PDFs contain crochet patterns for the bear, its hat and scarf, and a miniature Christmas stocking. Nice Little Holiday Bear I hope you have fun hookin’ up these cuties. 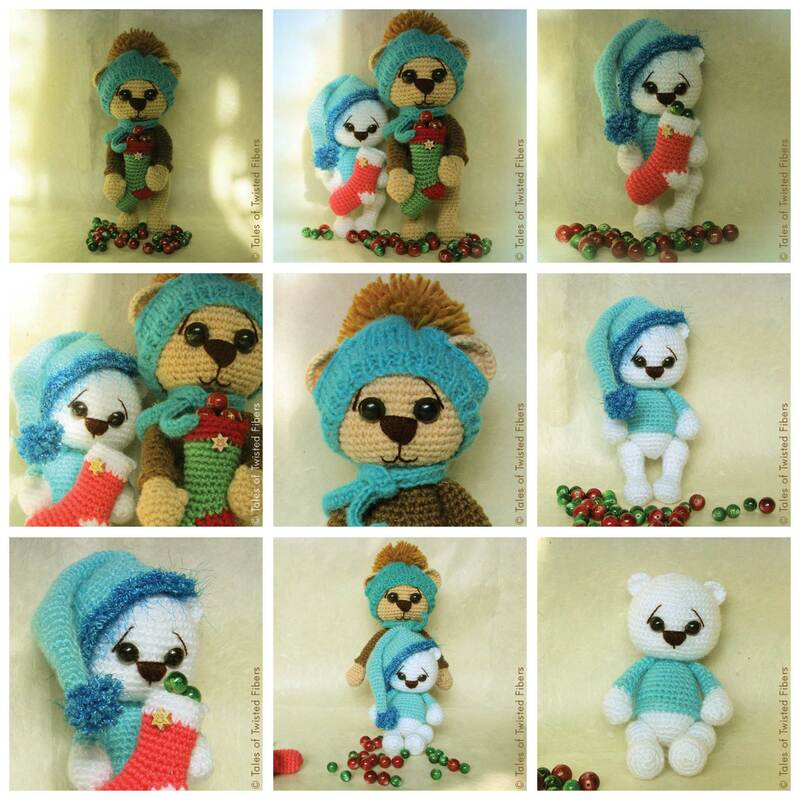 Update (November 1, 2013): The patterns for the Naughty and Nice Holiday Bears are now available in DANISH, thanks to Marianne who translated both the patterns. The Danish patterns for the Naughty Little Holiday Bear and Nice Little Holiday Bear can now be downloaded from her blog. Update (November 10, 2013): For SPANISH translation of the Nice Little Holiday Bear pattern, please visit Lyanne’s blog. Thanks for taking the time to translate and share this pattern with your readers, Lyanne. 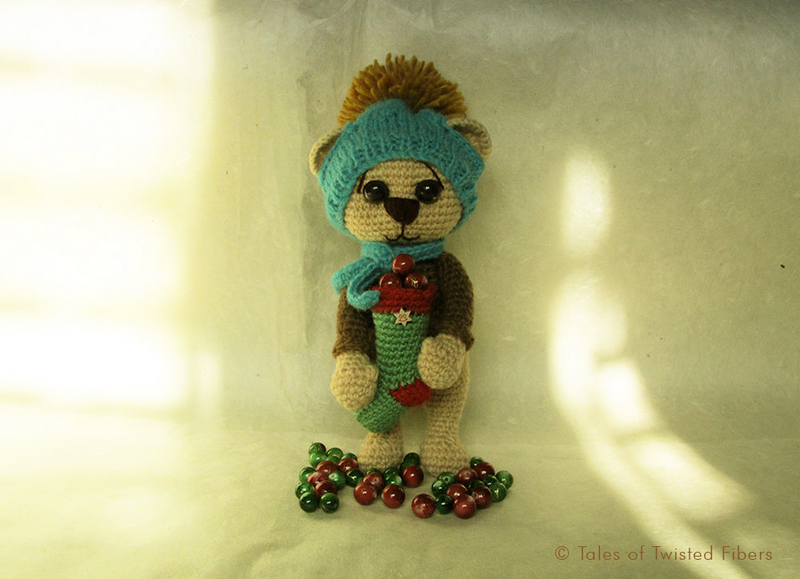 Update (May 07, 2016): To download the pattern for Nice Little Holiday bear in DUTCH, translated by our fellow crocheter Nanske, click here. 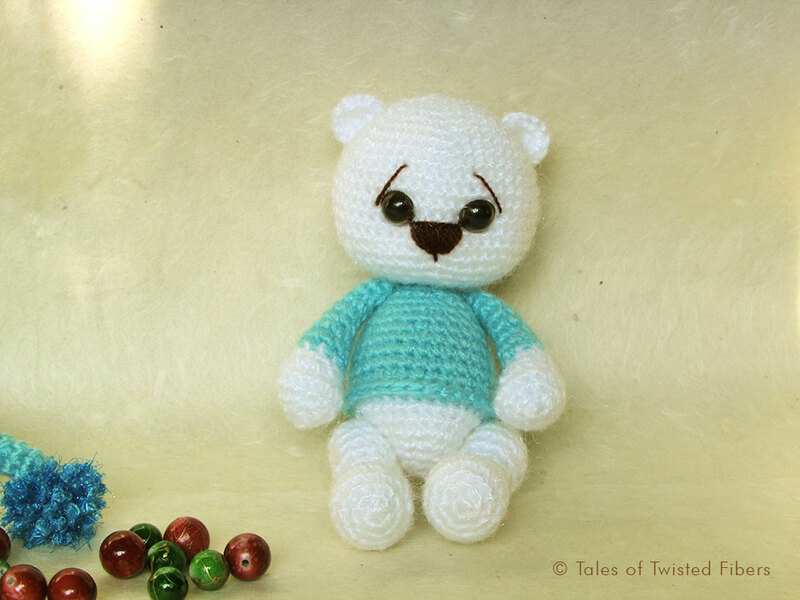 Update (November 08, 2016): To download the pattern for Naughty Little Holiday bear in DUTCH, translated by Anja Van der Spiegel, click here. Amaaaaaaaaaazing, heel hartelijk bedankt (dutch) thank you SO much….yr an angel! Yeah, I thought ‘why not give our lovely crafters a head-start on holiday amigurumis making’ 😀 I hope you will soon find the time to make these two. WOW, these are just adorable and I love teddy bears, thanks for sharing these. Just put these on my Christmas ‘To Do List.’ Grandkids will love them. Thanks for sharing with us all. As always you did amazing work and these will make great XMas presents. Thanks for making this pattern and for sharing it with us! These are so cute! Thank you so much for the patterns! Oh my they are just soooooo adorable thanks for sharing the pattern! Thank you, thank you, thank you! I love bears of all kinds and yours are absolutely adorable!! I can’t wait to get some time to work on them. It is so kind of you to share your patterns. As always I love your work & OMG! these are just adorable. One thing if you could let me know what weight of yarn & size hook should be used or does that part really matter? Thank you, Debbie. I use light worsted weight yarn and a 2.50 mm hook for (almost) all my amigurumis. So yes, this pattern will work well with light/medium worsted weight. In fact, you can use any yarn you want as long as you use the same weight for all doll parts. I’ve never used Afternoon Cotton but according to its website, it’s light worsted and should be worked with an F hook (3.75 mm). Should you decide to work with this yarn, I’d suggest you use a hook that’s a bit smaller than what’s recommended to keep the stitches tighter and to keep the stuffing from peeping through the gaps. The pleasure’s all mine 🙂 And I’m really really glad you like them. Thanks for sharing, I love your patterns. How do I share a picture of the nice little bears I have made using your pattern? The “Download” links above do not download the pattern pdfs, but take you to a page asking you to download a ‘Mega’ app which I do not want or need. Thanks. Quite some time ago I shared one of Serah’s free patterns. I said she was crazy for offering these adorable creations up for free and I still stand by that. She’s crazy but I do appreciate it as I can’t always afford to collect all of the adorable amigurumis I see. This is a post from last year that I stumbled upon after collecting some of her latest creations. The two I just snatched up are perfect for everyday and the upcoming Halloween holiday, celebrated in the states, but these two are great for Wintery Holiday gifts. A Naughty Bear and a Nice Bear, remind me of my three kids, would make great stocking stuffers. Maybe if I get started now, I can make some of these Naughty Bears for my naughty trio and some Nice Bears for White Christmas with the in-laws. Thanks for being so crazy, Serah! Hi, I just found your site on Pinterest and am interested in Bobbles, the little boy angel. Can you tell me where to find him? Thank you for such lovely little treasures. How tall are they?